I love these cookies. At least I did last night when I ate way too many of them. I love chocolate chip cookies, but I was craving something a little heartier (dare I say healthier?) when I made these. I am in no way claiming that these are healthy cookies, but something about adding oatmeal to cookies makes them seem heartier and good for you. It's not true, but I like the thought anyway. So for my 100th post, I give you Oatmeal and Chocolate Chip Cookies. Enjoy! Beat the butter and sugars together, using the paddle attachment of a stand mixer, until light and creamy. Add the eggs, one at a time, until just incorporated, then add the vanilla. In a separate bowl, sift together the flour, baking soda, baking powder and salt. Add the flour mixture to the butter a little bit at a time until just incorporated. Add the oats and chocolate chips and stir in by hand. Drop cookies in 3 T mounds on a greased cookie sheet. Bake for 14 minutes or until just starting to turn golden. Cool for a minute or two on the cookie sheet before removing to a wire rack to cool completely. Enjoy! whooohooo! Congrats on the 100th post! The cookies look mighty tasty too. I love oatmeal in my chocolate chip cookies. 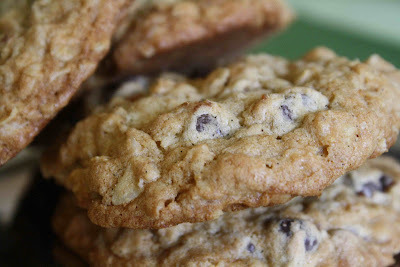 I love oatmeal chocolate chip cookies and these are the best I have ever seen. I love using vanilla bean paste! I just love oatmeal chocolate chip cookies. I think I will make a batch of cookies today, thanks! Your cookies look really good! Yummm. My favorite cookie, oatmeal chocolate chip. :) Congrats on the hundreth post!! I'll be around when you break 200. . . I LOVE chocolate chip cookies...but I'm definitely going to be making this recipe the next time I get a craving. I love your recipes. They're so comforting...my favorite kinds of food! You have a very lovely blog! I am sure to be back! Thank you for your visit to mine and your comment on my vanilla bean post! What a great classic looking cookie! Heaven knows I could eat way too many of these beauties! Happy 100th post! And a lovely one it is. Congrats on your 100th post! I love chocolate chip cookies in any way, shape or form. Yours are making me crave a few! Congrats on your 100th post. I want to make a comment on the cookie recipe. What is Kosher flake salt, and where can you get it. If it is a large flake salt won't it be difficult to sift it in with the flour mixture using a strainer. Holler - you have better will power than I! Michelle, Parker and Juliet - Thanks! Aren't oatmeal cookies the best? Meg and Sharon - I use vanilla bean paste in absolutely everything. I don't even buy vanilla extract anymore. lalycairn - I hope you will be! Joanna - your beautiful photography and wonderful quotes are comforting to me so we're even! Leslie - Thanks for coming by! Jenny - I ate most of them myself - ahhh the perils of baking. Bridgett - every time I see this post, I want to make another batch - doing my best to hold out now! Anonymous - I do use kosher flake salt and I get mine at Trader Joe's. Most of the flakes will not sift through my strainer, but I go ahead and throw them in anyway so I can put all of the dry ingredients in at the same time. I simply turn the strainer over and let whatever won't sift through, fall out into the bowl. Croquecamille - we must have been on the same wave length with these!